This week we are taking a look back at some of our FAVORITE posts of 2009. Enjoy! One of my favorite Finishing Touches for any event is PHOTOFETTI. PHOTOFETTI is one of those genius ideas created by a bride who was looking for a way to personalize her own wedding and then due to the overwhelming response of family and friends, turned her idea into a fabulous business. So what exactly is PHOTOFETTI? It is double-sided photo confetti made from your snapshots and mingled with your choice of colorful accent confetti. 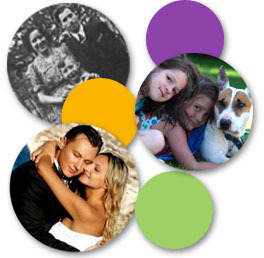 Each package of PHOTOFETTI contains up to 10 of your photos and 3 accent colors. It is perfect for Mitzvahs, Weddings, Rehearsal Dinners, Showers, and Birthday Parties. Scatter it around your centerpieces and everyone will remember this personal touch. Click here to visit Photofetti. The website makes ordering your PHOTOFETTI very simple. You choose your package and quantity, upload and crop your photos, pick your accent colors and you are done. PHOTOFETTI Tip: I used PHOTOFETTI for my son's Bar Mitzvah and I was unable to select just 10 photos. Instead I ordered 2 smaller packages so I was able to use 20 different photos.